Two posts ago I wrote about the difficulty we encounter, when reading Plato’s dialogs, distinguishing his teachings from those of Socrates. Because the Apology is an early dialog and the subject matter is Socrates himself, it may give the most accurate portrait of him of all the dialogs. The apology is a “transcript” of Socrates’ defense while on trial for his life. 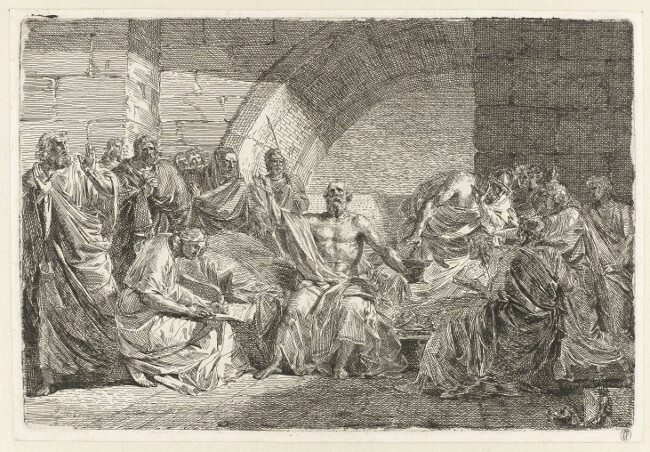 In the decade following his execution (in 399 BCE) a number of authors wrote their own accounts of the trial, and Plato probably wanted to create a definitive version to defend the memory of his teacher. Of course no record of the trial is completely accurate, if only because the Greeks had not yet invented the concept of a court reporter and thus had to rely on their memories of what was said. Transcending fear, particularly the fear of death, is one of the great benefits of studying philosophy. Unmotivated by fear, Socrates was free to follow his own convictions–and possibly the urgings of his daemon–and seize on the trial as one more chance to educate the Athenians and set an example for his students by demonstrating his dialectic. No one, least of all Socrates, is surprised when the court returns a “guilty” verdict. The prosecution recommends the death penalty. Athenian law allows the defendant to propose his own penalty, and everyone expects him to suggest exile, which the jury will probably accept. Instead, he proposes a trivially small fine, saying its the most he can afford. He then raises the number, after Crito and others offer to pay. Obviously, though, if Socrates’ friends are paying it won’t really be a punishment. Socrates is sentenced to die and soon becomes the most famous martyr to philosophy in Western history (or perhaps the second most famous, depending how one classifies Jesus). At this point, let’s pause to contrast the careers of Socrates and Plato. Socrates “The Gadfly” was an outsider who was always as odds with, and ultimately executed by, the system. Plato was a respected citizen who died in his sleep at a party. Socrates’ teachings were primarily dialectical–dealing with ways to change and improve society. Plato’s were primarily metaphysical and idealistic and implied that one might as well accept society because the physical world wasn’t the real world anyway as well as advocating a world view that was ultimately static. Socrates discarded his (probably lower-middle) social class and became something else. Plato remained close to his aristocratic roots. Socrates conversed in the streets and at dinner parties. Plato taught at an a academy. If we think of “philosopher” as a role in society then, in many ways, these two men are the original archetypes of the two kinds of philosopher that have historically been found in Western Civilization. For want of better terminology, I call them Outsiders and Academics, and I am currently writing a book about the Outsiders. While I would of course love it if you were to buy my book, when it comes out, everything you really need to know about the two can be found by studying Socrates and Plato. Outsiders like Socrates are the initiators: they force society to examine new ideas. Since societies don’t really like new ideas, the Outsiders usually suffer for it, financially and/or physically. The Academics, on the other hand, safe within legitimized social organizations such as universities, are the developers and guardians of the new ideas which were first introduced by outsiders. Occasionally, an academic is able to conceive and promulgate a truly original idea, but this is rare because the process they go through to earn their positions selects against innovators and because they have too much to loose to buck the system. Our civilization seems to need both types of philosopher to function. Last week I placed a new academic working paper on Academia.edu that roughly parallels Chapter 11 of my upcoming book. The version in the book will be written at a different reading level and without the math equations, but this is still a pretty good taste of what is coming. Scholars like to post these preliminary drafts for several reasons. The most important one for an independent researcher like myself is to receive feedback and suggestions prior to submission. Another reason is to make findings available to the community sooner. The average turn-around time to publish a journal article is two or three years and the field may have moved on by the time the paper hits the presses. I probably don’t need to worry about obsolescence with this particular article, since the events with which it deals happened back in the 1950’s and 1960’s. My book will be a study of the role of outside scholars in our society and, in particular, their ability to shape public policy. Outside Scholars, in my usage, are people who engage in research and knowledge creation without being formally affiliated with the dominant academic community. This particular article/chapter deals with an outside scholar named Victor Sharrow who devoted his life to arguing for what he saw as the “correct” interpretation on the Fourteenth Amendment. He was ultimately unsuccessful, but I feel his career provides several intriguing insights as a characteristic outside scholar narrative. 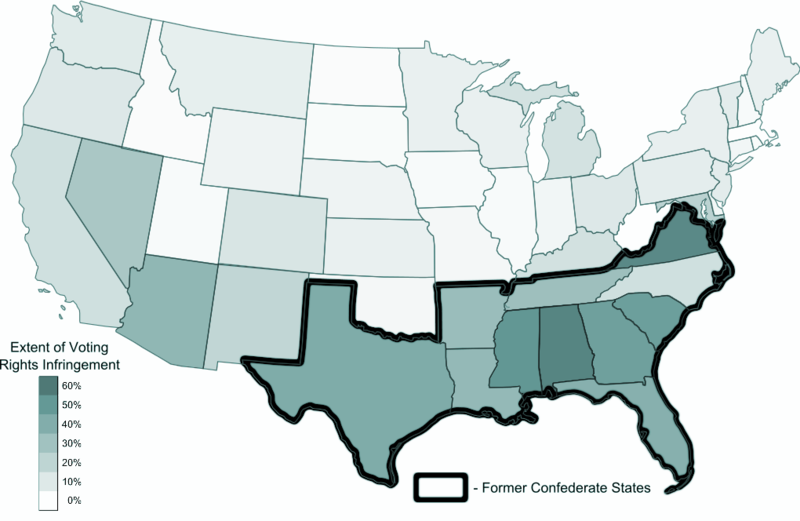 Sharrow saw the Fourteenth Amendment as the key to dismantling the Jim Crow system in the South. In the months prior to the 1958 election he mounted an intense one-man lobbying campaign to sway Dwight Eisenhower and other politicians to his views. In my article I examine several of his arguments from a standpoint of modern data science. Those of you who read my posts on data science and Python programming might be interested in the simulation models I describe in the paper. I would be happy to send my spreadsheet and code to anyone who is interested. Just e-mail me or message my Facebook page. If all goes well, the book should be released in late 2016 or early 2017.